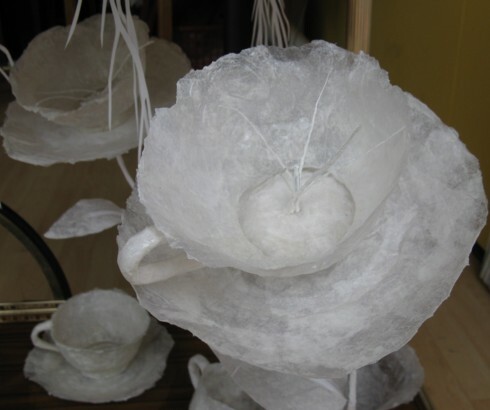 This playful installation draws the viewer into a dreamlike world of teacup flowers, bluebell jugs and teapot roses. Delicate tissue paper and mixed media work is combined with a large pen on paper back-drop that has the feel of an overgrown illustration. The installation evokes childhood fantasies and stories such as Alice in Wonderland or Charlie and the Chocolate Factory. The divide between reality and imagination is addressed through the creation of a fictional world that interacts with the site, thereby creating a dialogue between internal and external worlds.